For a general guide to food and wine pairing CLICK HERE. 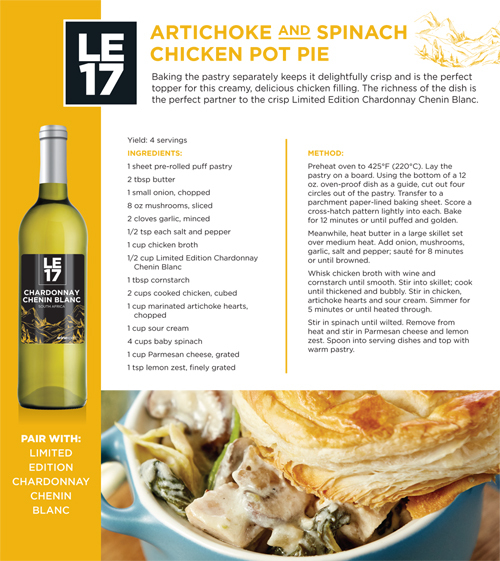 Custom recipes for the 2011 Limited Editions created exclusively by Food Network host Anthony Sedlak. Download the full recipe book here. Brining meats has been common place amongst grilling aficionados and meat lovers alike since the get-go. This easy apple cider brine is a sure way to impart a light apple flavour and great caramelization on the grill outside of ensuring the juiciest pork chop you have ever eaten. 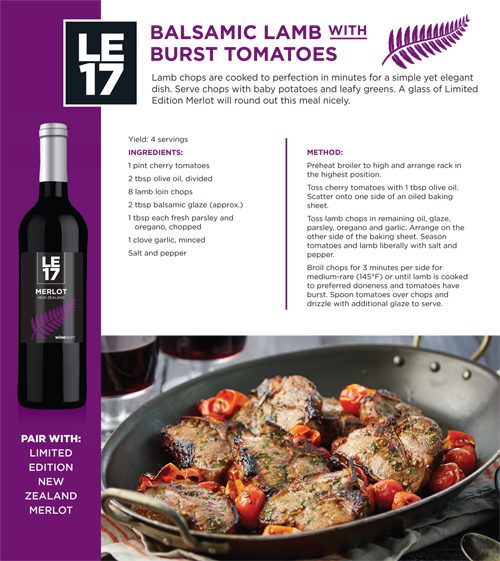 The subtle fruit flavour in the pork is held in marriage with the undertones of ripe berries and a hint of oak in the California Petite Sirah/Zinfandel. These extra juicy pork chops are perfectly paired with a simple green salad or insalata verde in Italian. Try tossing greens with lemon, extra virgin olive oil, grated parmigiano-reggiano, toasted pine nuts, minced shallot, a touch of salt and freshly cracked black pepper. Combine all ingredients, excluding the pork chops, in a large sauce pot and bring to a simmer. Remove from the heat and refrigerate for 12 hours. and season lightly with kosher salt and freshly cracked black pepper. grill for 2 – 3 minutes. Next, flip the chops, turn the heat to medium and close the lid of the BBQ. Cook the chops for 4 – 5 minutes, turn 45 degrees and continue to cook for 2 – 3 minutes to achieve medium-well doneness. Remove the chops from the grill and place onto a serving dish. Rub the chops with the butter and allow them to rest for 5 minutes before serving. LE 2011 – February Red from Maverick Video Group on Vimeo. 1. Rinse whole lettuce leaves and pat dry, being careful not tear them. Set aside. 2. In a medium skillet over high heat, brown the ground beef in 1 tablespoon of oil, stirring often and reducing the heat to medium, if necessary. Drain, and set aside to cool. Cook the onion in the same pan, stirring frequently. Add the garlic, soy sauce, hoisin sauce, ginger, vinegar, and chile pepper sauce to the onions, and stir. Stir in chopped water chestnuts, green onions, and sesame oil, and continue cooking until the onions just begin to wilt, about 2 minutes. 3. Arrange lettuce leaves around the outer edge of a large serving platter, and pile meat mixture in the center. To serve, allow each person to spoon a portion of the meat into a lettuce leaf. Wrap the lettuce around the meat like a burrito, and enjoy! 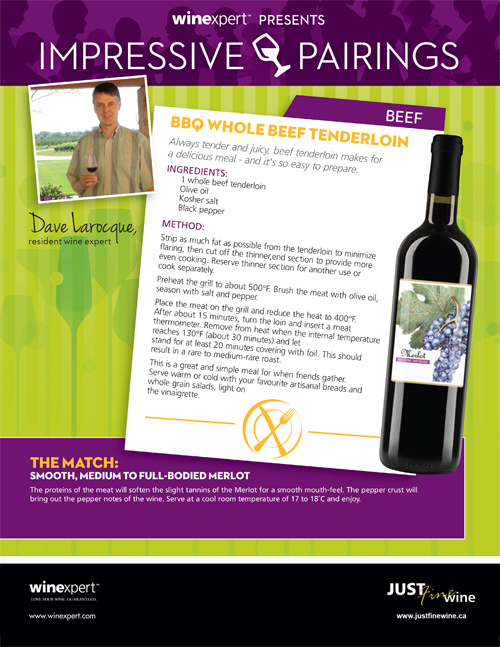 Host a backyard BBQ and pair it with our Selection International Australian Shiraz. Don’t forget the ribs!